Warning....this post has absolutely nothing to do with sewing. We leave tomorrow for our apartment hunting trip to Paris. That meant some serious shopping had to take place. I hate shopping for clothing...there are just so many other things I would rather be doing. Clothing shopping is endless. Always searching. It's exhausting. I live in Alaska. Dressing up for me is putting on a clean pair of jeans and wearing my Dansco clogs! I am fortunate to be slim...I've been a regular Jazzerciser for 17 years. I can buy off the rack without fitting problems...but I still hate it! I have the prerequisite "little black dress." Black slacks that have skinny legs. A skinny black skirt. I found two pair of black capris yesterday...I think I'll be wearing these the most. A few fun tops. I really like these two, simple dresses. And then just for fun...sparkly pink shoes. Finally...a pair of denim capris! After I drop the dogs off at the kennel I will grab a pair of black flats. I was just too tired to get that last essential piece for my wardrobe. Accessories? Darn...don't have those either. Definitely not worrying about those items right now. Three nights ago I was sitting at my desk, watching TV and doing a little stitching on a Christmas ornament. Jenny was sleeping against the basement door. I noticed a movement outside. It was a baby black bear coming to check out my dog...through the glass of the door. I tried to get a photo but I was trying not to scare the bear so by the time I had my camera ready to go the dogs had seen the bears (there was a mamma and another baby bear) and the barking commenced. You just have to imagine an adorable baby black bear peeking in the door at Jenny. Then last night I decided it was finally time to set up my sewing machine and turn it on. I'm missing the knee lever...have to use my spare that is for regular tables so it travels to classes with me...not as comfortable. Sure hope I find it soon! I started working on June's Breakfast Club blocks. Tonight I also started putting rows together on a quilt from May's Breakfast Club. 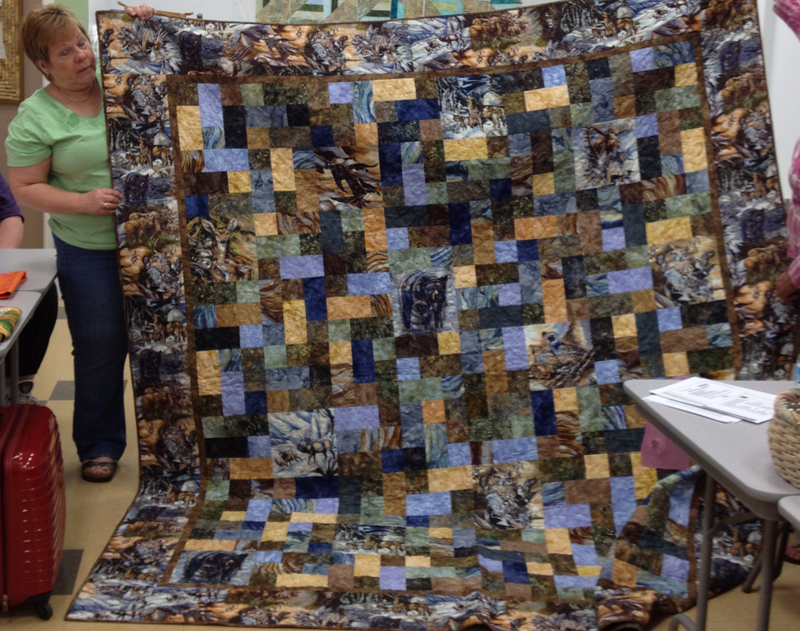 July's Breakfast Club was today but I only stopped in to say "hi," and spend money on more fabric for the stash. There was a sale...50% off the ends of bolts and there were several batiks to choose from. Check this out!!!! A live camera at Brooks Falls in Kodiak that you can watch on the internet. The camera is there to catch the bears as they fish for salmon. It really is amazing. I hope you will visit the site. I'm joining Kathy's link-up for handwork projects on Sundays, Sunday Stitching #5. First a recap of yesterday's finish, a cross stitch ornament - "Hawaii Santa" - a three-ornament series from Mill Hill that is stitched on perforated paper. I am addicted to these small projects because of their portability. And they are so darn cute! Next is another addiction...Bucilla felt stocking and ornament kits. I am working on a set of ornaments, "North Pole." I don't know why but it seems to take me forever to make a set of six ornaments. Santa is the first, and I'm close to having him done. I cut out an arm piece ahead of time and now it has disappeared so I will have to wing it! This ornament matches the stocking "North Pole," that I finished in 2008....WOW...that was a little while ago. These kits always make me smile. Santa is stocking up on lots of vitamin D in preparation for Christmas 2012. Just finished one of three ornaments in the "Tropical Santa Series - Hawaii Santa." Love his Aloha shirt and pineapple drink with an umbrella! I'm not sure where I'm going with this post but I feel like I am making some progress in the studio. I have a Hinterberg frame for my Nolting Fun Quilter. It took me three days to put it together. The first obstacle was a missing leg leveler...just so you know these are readily available at Home Depot. The next obstacle was I realized one of the additional supports I had for the frame never got stained so I searched for the oil...I remember I saved it from the old house just for this purpose...found it. On the third day it all came together. Well...I have no idea where to put all of these objects. And what do I do? I do more "gathering." Here are the latest acquisitions to my stash. Why am I so slow at putting my sewing room together? It feels like it is taking an eternity! Yesterday I just couldn't stand it anymore...I started putting the frame together for my midarm. Of course I am missing one little piece that is crucial to leveling one of the supports. Hopefully I can find a replacement at Home Depot today. I'm also realizing I need to move everything around once again. Just enjoying a quiet moment after today's dog walk. Thank you my dear friends for you words of support and encouragement. Our summer has been very gray and cool (daytime temps are in the 50s.) A bit of a disappointment although everyone here pretty much agrees it is better than 100 degrees with devastating fires so we are trying not to complain. We spent a night in Talkeetna which is usually very sunny this time of year with spectacular views of Mt. McKinley, but not this summer. Talkeetna is a tiny town best know as the place where climbers of Mt. McKinley catch their flights to base camp. It's also right where the Susitna and Talkeetna rivers meet which is prime King Salmon fishing...but not this summer either. Fish counts are so low there is no fishing allowed for King Salmon. But we had our cabin reserved almost a year ago so we made the best of it. Walking the dogs around town, my thoughts were on Paris. I don't think I will see any electric outlets in parking lots in Paris. Talkeetna gets more snow and even colder temperatures than Anchorage so having a place to plug in your car's engine block while you are at work all day is a nicety. I wonder how many other things I will notice in the next couple of months that I won't be seeing in Paris? I might have to tell you about my first trip to Talkeetna someday...lots of Alaskans have boat stories...I'm one of them. I mentioned on New Year's Day that 2012 was going to be a busy year for me. We were in the middle of building a house. I knew my husband would be putting in for a position in Paris and I fully expected him to get it. I feared all along I would have to give my dogs up and that has now become a reality. I am looking for a new home for them and I am close to having a wonderful story to tell...so despite many tears already shed there will be a few more before we get there. Blogging might be more of a stress reliever than creative outlet. I did do some retail fabric therapy...though I have absolutely no idea when I will ever find time to touch a sewing machine again. I think my lack of gardening this summer led to a "must have" feeling when I saw these batiks. These three pieces of fabric were tremendously cheaper than putting in landscaping at the new house so totally justifiable. I'm still plugging away on the sewing room organization. I love the sturdiness and flexibility of using chrome shelves but the wire shelves themselves present a problem. Things catch on the wires when trying to move items on and and off the shelves. I spent several trips wandering around Home Depot and Lowe's trying to think of a solution to line the shelves. I thought about buying sheets of Formica but cutting those to size required professional tools. One fellow at Home Depot suggested using tile...he had seen it done and thought it looked great. Well...I certainly had the tools to cut the tile to size but that seemed more bulky than I really wanted. I guess I wandered enough...laminate tile sheets are the answer. I can cut them to size using a razor knife. It's not easy but three runs of the razor to score the tile is enough to flex it to snap. Here's a look at the newly lined shelves. I did my entire pantry with this method and it is working like a charm. Very easy to keep clean. Just a bit time consuming cutting the tiles. I get tired after about three shelves or nine tiles. Not as easy to cut as fabric. I did not pull off the paper backing completely...just a little around each edge. The adhesive is very sticky and long black dog hair seemed especially attracted to it...not a good thing. I think it took me two weeks to organize my pantry. I finished it on the 4th of July...I was definitely up for a little celebration. 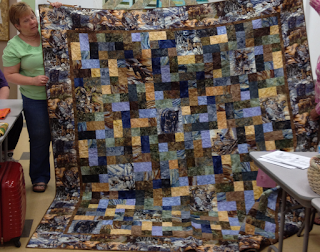 I'm cheating...here's a picture of Marcia's completed "3,6,9." She made kits for the shop so mine will look very much like this...someday. I'm still working on unpacking the studio. I'm thinking the studio will get set up before our closets do...but maybe the family shouldn't rely on a quilter's priorities when it comes to finishing a house. This photo shows one of the two chrome shelves I set up yesterday. I hope to make a major dent in the removal of boxes because I can cram a lot of stuff on those shelves! Here's why there is still no sewing going on. The table for my machine is currently the computer table. Absolutely no room for anything else on that table! I did finish another Santa ornament. Avignion Santa from the series of Medieval Santas. He looks right at home on the keyboard. Time to go check out what everyone else is doing over at Judy's place.